There were no reportable fatalities in 2009/10, compared with none during the previous two years. There were 50 major injuries reported during the period, a rise of twenty compared to 2008/09 (a particularly low year) and compares to an average of 42 major injuries over each of the previous five years. 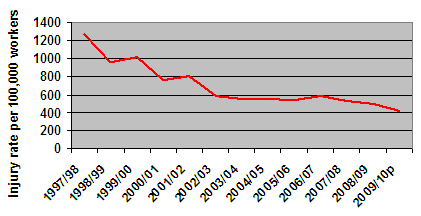 There were an estimated 26,598 offshore workers in 2009/10, a fall of 5.76% on the 2008/09 estimate of 28,224 workers. These figures were obtained from an industry-based data source1. 27 major injuries (54%) were due to fracture3. The number of reported over-3-day injuries has reduced this year by 30 to 110 (21.4% fall) and continues the downward trend since 2006/07. Based on the workforce figure of 26,598 workers, the over-3-day injury rate per 100,000 workers (413.6) for 2009/10 shows a 16.6% fall on that recorded for 2008/09 (496) and is a new low. 29% of injuries were to parts of the foot and lower limbs and 15% to the back, neck and torso area. The total number of cases of offshore ill health reported was 13, a decrease of 8 on the previous year. The diseases reported were chickenpox with 5 incidents (down 2 on last year) and 1 case of mumps. Occupational health conditions included 4 cases of hand-arm vibration and 1 case each of decompression, barotrauma. There was 1 case of legionella. 443 dangerous occurrences (including well incidents) were reported. Main types of dangerous occurrences reported were hydrocarbon releases (42.1%), fail equipment offshore (23.4%) well-related incidents (6.3%) and lifting operations related (8.6%). There was a significant increase in the total number of Major and Significant HCRs (85) in 2009/10 compared to the previous year’s total of 61. This compares to an annual average of 73 over the previous five years. 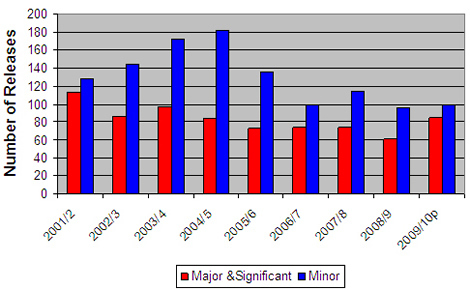 The number of minor HCRs rose slightly in 2009/10 (100) compared to 2008/09 (96). 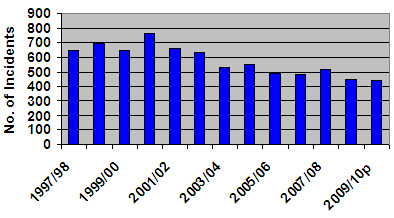 Overall the total number of releases rose by 26 in 2009/10. This bulletin provides provisional data for 2009/10. A further breakdown of the headline figures contained in this Bulletin will be provided later this year in the annual Offshore Injury and Incident Statistics Report, produced as part of the HID Statistics Report (HSR) series of publications. Interpretation of trends over a short period of time should be treated with caution, particularly when addressing small data populations. Whilst incidents occurring in marine and transport activities are not regulated by HSE, but may be related to the offshore oil and gas industry operations, it is noted that on 1 April 2009, a helicopter flight returning from the Miller platform to Aberdeen ditched in the sea with the loss of 2 crew and 14 offshore workers. Also one worker was killed in a lifting related incident on a diving support vessel when in transit.